To bring the port back to UP state, manual port reconfiguration is required or auto recovery feature should be enabled on the switch. When the number of TC BPDUs, received by the switch, exceeds the specified threshold in a given time period, switch processes the excess TC BPDUs, after the specified time period expires. TC Protection feature should be enabled on every switch in a LAN environment. Loop Protection feature provides additional protection against L2 forwarding loops. STP relies on a continuous reception or transmission of BPDUs based on the port role. The designated port transmits BPDUs and the non-designated port (ROOT, ALTERNATE) receives BPDUs. 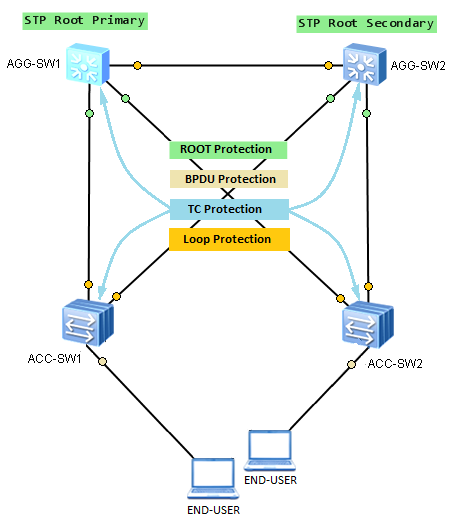 An STP loop is created, when one of the ports, of a physically redundant topology, no longer receives STP BPDUs. This usually happens, when ALTERNATE port in DISCARDING state stops receiving STP PBDUs, and as a result, moves to a Designated role and FORWARDING state. It means that there is no longer blocking port in redundant physical topology and loop is created. Loop protection feature, enabled on the interface, moves this port into Designated role and DISCARDING state, when no STP BPDUs are received in a prescriptive time. Loop Protection feature should be enabled on ROOT and ALTERNATE ports for every possible STP topology including failover scenarios. May 14 2013 13:50:06-08:00 Huawei %%01MSTP/4/LOOP_GUARD(l):MSTP process 0 Instance0's LOOP-Protection port GigabitEthernet0/0/1 did not receive message in prescriptive time! Recovery is automatic when port starts receiving STP BPDUs, no additional administrative intervention is required. By default Loop Protection feature is disabled on Huawei switches.